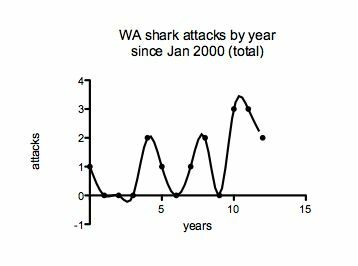 Sharkenings - the shark attacks to come? You are here: Home / Featured / Sharkenings – shark attacks to come? Is it safe to go back in the water yet? If you had time to watch global traveler Simon Reeves in the first of his latest TV series on the Indian Ocean, you’ll have seen him quaking in his wetsuit as he set off in search of sharks close to the South African coast. No woosie shark cage for him. The intrepid adventurer nestled under a rocky overhand as ragged-toothed sharks glided by. His host argued that you can enter the water with sharks around and emerge unscathed. No risk of shark attacks? 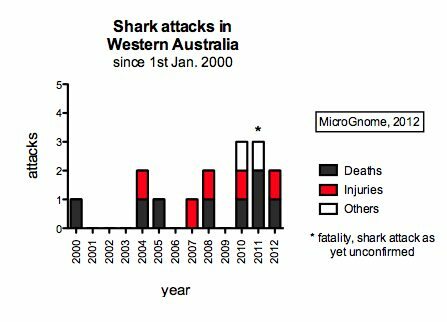 The figures show a fluctuating annual total of reported shark attacks. There’s even a hint of an emerging three yearly cycle. Maybe someone out there has got an idea what might be causing that.